I have a quick little recipe for you today. These tasty halloumi fries with a harissa yoghurt dipping sauce. We tried these when we went to Camden Market a while ago. Oli Baba’s halloumi fries are legendary so we had to try them and we instantly fell in love with halloumi fries. Unfortunately for us, we don’t get to London nearly as much as we would like, so I have to make my own. Now, these halloumi fries are a little bit different to the ones we had in Camden but they are still a firm family favourite treat in my house. I don’t own a deep fat fryer, it’s just never been on my list of kitchen essentials, so I shallow fry these halloumi fries. Which also means we eat them in batches, as they are really best eaten hot. But hey, we’re ok with that. The spices I used to coat the fries are a mix of sumac and ras el hanout. This spice mixture gives the fries a warm spicy kick but they are not too spicy, the kids will still be able to dig into these. I used olive oil to cook them but any mild flavoured oil would work well too. These halloumi fries need to be eaten as soon as your mouth can handle them, so don’t hang about, as soon as the kitchen paper has soaked up any excess oil get stock in. These fries need extras though so I usually serve these with a spicy harissa yoghurt sauce, this may be too hot for younger kids so plain yoghurt or the coriander yoghurt sauce I serve with my spiced chicken skewers would be great too. For the adults, these halloumi fries are really good with a cold beer, so are a game night winner. 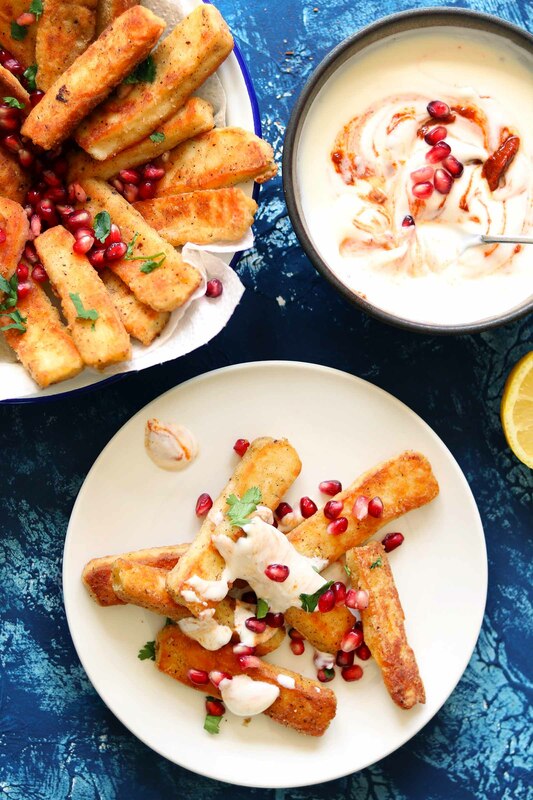 The best way to serve these halloumi fries is with a generous serving of pomegranate seeds, a good squeeze of lemon juice and a big old dollop of that spicy harissa yoghurt sauce. The sweetness of the pomegranate seeds balances those warm spices and the lemon juices cut through the saltiness. So, if you like halloumi you will love these but if you find halloumi on the salty side then you might want to give these a swerve, they are salty, but hey, that’s why we love them. Crunchy, spicy and totally addictive these halloumi fries are perfect for weekend snacking. Cut the halloumi into chips of roughly 2cm thickness. 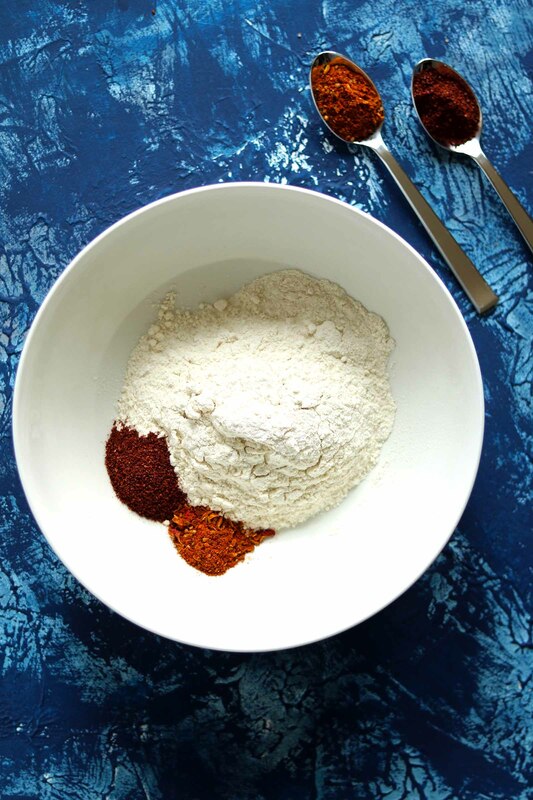 Mix the spices into the flour. Dip the halloumi fries into the flour, make sure they are well coated. Heat the oil in a large non-stick frying pan over a medium to high heat. Add the fries, cook for about 2 minutes on each side. Don't overcrowd the pan, cook the fries in batches. You can keep them warm in the oven until ready to serve. Once cooked transfer the fries to a bowl lined with kitchen paper to soak up any excess oil. Transfer to a serving dish. Then serve immediately with yoghurt dipping sauce, pomegranate seeds, chopped coriander and plenty of lemon wedges. Pour the yoghurt into a serving bowl. Swirl the harissa paste into the yoghurt then leave in the fridge until ready to serve. Calories listed are approximate and do not include the yoghurt dipping sauce. To make your halloumi less salty try rinsing it under a cold tap then patting dry with kitchen paper. However, this may make it harder for the flour to stick to the halloumi. If this is the case, try dipping the halloumi in milk before dipping it in the flour mixture. The amount of oil you use will depend on the size of your pan, and how many batches you cook. I used 4 tablespoons. To test that the oil is ready drop a tiny sprinkle of flour into the oil if it fizzes up then the oil is hot enough. I also wipe the pan clean in between batches if the oil has become cloudy and burnt. This will ensure that the next batch is nice and golden too. Oh my, these look wonderful. I bet they end us so nice and creamy when they’re hot. Such a great alterative to a traditional cheese stick. I absolutely love halloumi and these cheesy treats look absolutely delicious! The dipping sauce is a perfect pairing with the halloumi. Oh my, I wonder why I still have to try halloumi fries, they look delicious! I’m sure my family would go crazy over this! I’ve never heard of halloumi , but I’m interested. 🙂 This looks fantastic! I’d eat a whole bunch. Lol! I’ve never had halloumi before but I’m sold! This looks so amazing! Love the seasoning on that! And I have liked every kind of frying cheese I’ve had – such a wonderful snack! These fries look amazing! I love harissa, so need to try this. I’ve made mozzarella sticks, but this seems so much easier. Thank you so much Kitty. Ah, you just reminded me how much I love mozzarella sticks! Fried Halloumi cheese is something I discovered when I started eating low carb. It is absolutely amazing! I can’t wait to give your recipe a try. I can’t get enough cheese and this looks so yummy! What lovely photos as well! My husband enjoys anything spicy so that dipping sauce sounds right up his alley! These sound wonderful! I think my family would love that yogurt sauce with a salty cheese! You had me at CHEESE. These look ridiculously good! My little girl would be alllll over this. I love the sweet pomegranate pairing with it too! Thanks so much Lauren x My girl loves these! Hmm. This is the first I’ve heard of halloumi fries. Fries are like my worst addiction so I’m absolutely intrigued. I can’t wait to try these out!